Social networks are a big part of today’s life. We’ve all heard that “if you’re not on Facebook, you don’t exist”. We have discovered the power of Snapchat and Instagram and how to use them to rock our events. We talked about email marketing. Today it’s time for Twitter. According to Statista, in the first quarter of 2017, there were over 325 MM active users on Twitter. So I think it’s safe to say that Twitter can be remarkably useful when planning to market your events. But keep in mind that you must be short (there are the 140 280 characters and 140 seconds limits) and fast on Twitter, so adapt your message accordingly. Social media platforms were created for the human to human interaction, so try using a less formal tone of voice. Be proactive and engage with your followers in dialogues. If someone asks you something simply answer the question. If you see something that you like let the world know (by pressing the little red ♡ or retweeting the post). A hashtag is a type of metadata tag used on social network and microblogging services which makes it easier for users to find messages with a specific theme or content (Wikipedia). It brings together all the posts that have a certain #, making the search easier. We all know how important hashtags are, especially on Twitter. So it’s important to select a relevant # before you start to communicate your event. But be careful because one # can be used for many purposes (you can’t claim one just for yourself) so before launching it online verify it isn’t already in use. It seems that, like all social platforms, Twitter too favors visual posts. So, whenever possible, include photos in your posts. 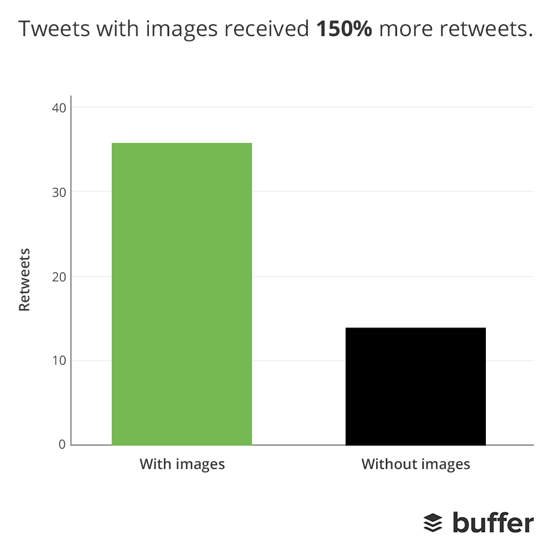 Reports from Buffer claim that posts that include pictures receive 150% more retweets and are more likely to generate engagement. Of course, “just death and taxes” are certain in life, so you should test to see what works best for your particular case. But if you don’t have the time to test…go visual. Although, as mentioned before, is very important to be present, there will be moments where it will be impossible for you to be online. We all know it’s better to post when your followers are more likely to be active. Apps like HootSuite and Buffer work wonders in these situations. And they also save you precious time. Maybe you are the mastermind behind the event, but there are many people involved in it. Colleagues, caterers, sponsors, performers etc…ensure that everyone is involved in your Twitter talks and that they all are using your hashtag. It helps you to create buzz and also and shows that you all are just one big team. A great way to create engagement and show your followers that you care more than just their money is to create polls. See what they want and implement it into your event. Maybe you can’t use a poll to select the location or the main artists, but there are aspects that can be decided with the help of your followers. And this is a great way to show them that their voice counts. Just because your event started it doesn’t mean that you should stop interacting with your twitter fans. 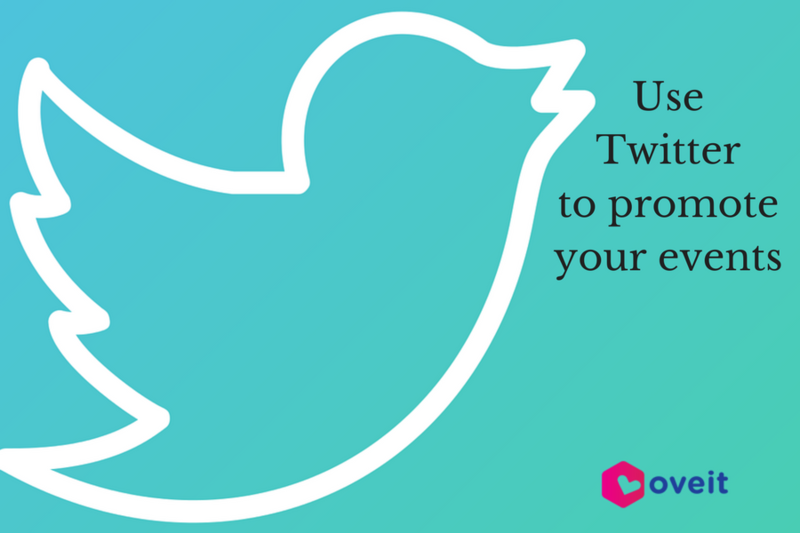 Use live tweets from the event and live video to keep your followers up to date. Not all of your followers were able to make it to the event, but they all want to hear from you; otherwise, they could just stop following you. No matter what your event is, one day conference or a 5 days festival, its superpower is bringing people together; and for this to happen people should first hear about it. Luckily we live in a time when it takes just a few seconds for your message to travel from U.K to Australia (200 years ago it would have taken 100 days for it to get there). Social media networks are the most powerful marketing tools of modern days, it would be a mistake to ignore them. To better understand the power of Twitter we should take a quick look at the numbers of the most retweeted posts. #1. 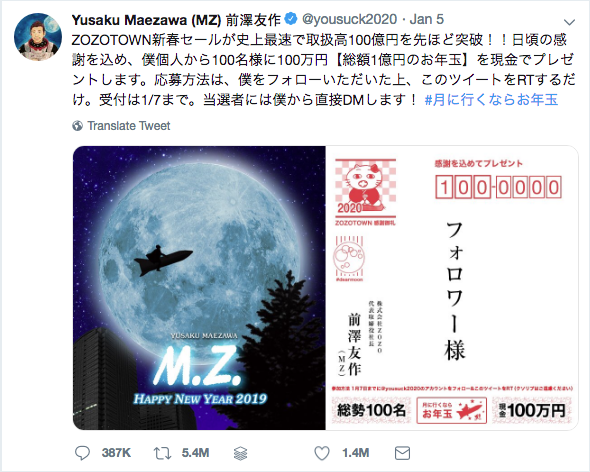 On the 5th of January Yusaku Maezawa, the CEO of Zozotown posted a tweet announcing that is willing to donate almost 1M $ to the first 100 users that follow him and share that tweet. 5 days later and he has over 5.4 M retweets. #3. 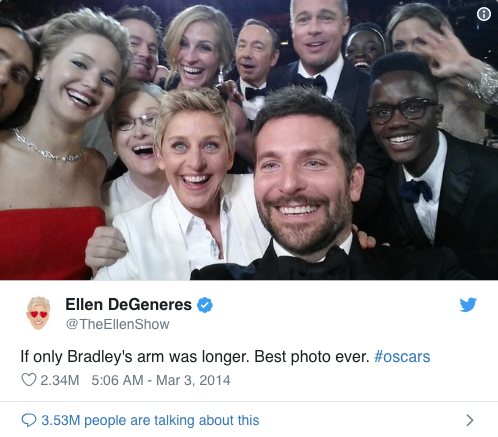 THAT picture from 2014’s Oscars! Yes, these are definitely exceptions, but a great way of showing the true power of Twitter (and social media as a whole). You will probably never make it to this Top3, but a powerful message will make it to your current and future attendees. 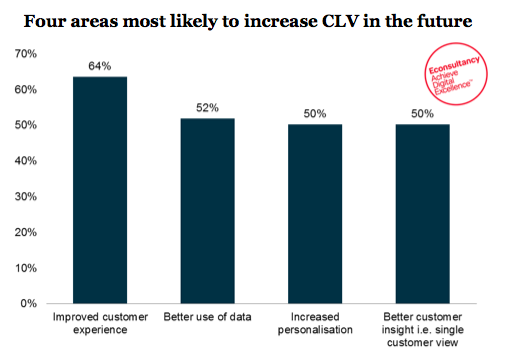 Customer lifetime value for Events – How to improve it? Quick question: what is more important for you: attracting new event customers or making sure the ones you already have stay happy and enjoy a nice experience? Though there is no absolutely right answer I would rather choose the latter. And there’s many reasons to do that. Better experiences for existing ticket buyers means more loyal customers. More loyal customers mean better word of mouth exposure. More exposure means new customers. So you see – there is no real choice between the two. It’s just that you need to take a customer lifetime value approach to managing your event business. By taking the long term approach to building your event brand, you choose the winning combination of increasing customer base AND improving customer loyalty and experience. What has been coined as the “customer lifetime value” is a metric that shows in fact two things. A. you value your customers and want to keep them as loyal as possible and B. you’re thinking long term rather than short term. If both A and B apply to you that means you are probably in for a long carrier in the event planning business. How do I know my event’s customer lifetime value? Simply put the lifetime customer value is pretty simple to express. It is the total revenue your company will receive from a representative customer throughout your total business relationship. That means everything your customer has paid so far and what he or she will spend in the future with you. Now let’s just stop right there. Do you spot the two main issues? One is the fact that there is no such thing as a representative customer. Each of your customer has individual habits so you must at least split your customer base according to specific attributes and spending habits (these are called cohorts in retail analytics but we can just stick with groups). The other main issue is that unless you have some special ability unknown to all of us other mortals, you are not really able to look into the future. What you can do is look back at your event attendees’ purchase history and try to come up with some sort of estimate for the timeframe you expect your customer to remain loyal to your events. These are the two basic elements used to improve customer lifetime value. One is segmentation and adapting needs to specific groups and the other is improving the total customer lifetime. You know what makes a great music festival great? The fact so many seemingly diverse things seem to fall right into place. It’s those tiny details that seem personal to different groups. But to do this festival planners, large conference planners and others have to take into account both similarities and differences between attendee groups. They have to create specific content for specific audiences, usually split among stages, seminars or multiple experiences. This way they can increase the event size and revenue, whereas at the same time they make it enjoyable for everybody. By targeting individual needs and structuring specific experiences for similar groups they are able to create intimate experiences enjoyed by large masses. If you can understand what makes your customers enjoy your events using segmentation, you can also personalize your communication and the experiences you are building. There are many tools out there that help you segment your communication strategy. Facebook (Custom Audiences) and Google both have remarketing options that allow you to display specific messages to specific audiences. Even direct marketing tools such as MailChimp provide off the shelf segmentation tools. They range from simple to advanced and you can fit right in your sweet spot. And yes, email marketing for events does work. What about in event customized experiences? That’s easy to do with NFC wristbands and we can help you with that. Based on your previous interactions with you attendees you can create personalized perks and interactive experiences. You can allow you loyal event goers access to specific areas (such as the VIP lounge or the backstage). You can direct them to curated experiences and you can just as well create personalized goods that can be handed when your attendees arrive at the registration. Such a personalized approach can make your customers feel valuable and cared for. 39 years ago the first mass email was sent, and the results were amazing. Starting that moment email marketing caught everyone’s attention and even though what worked a few years ago doesn’t work anymore, email is still one of the most used channels for marketing. 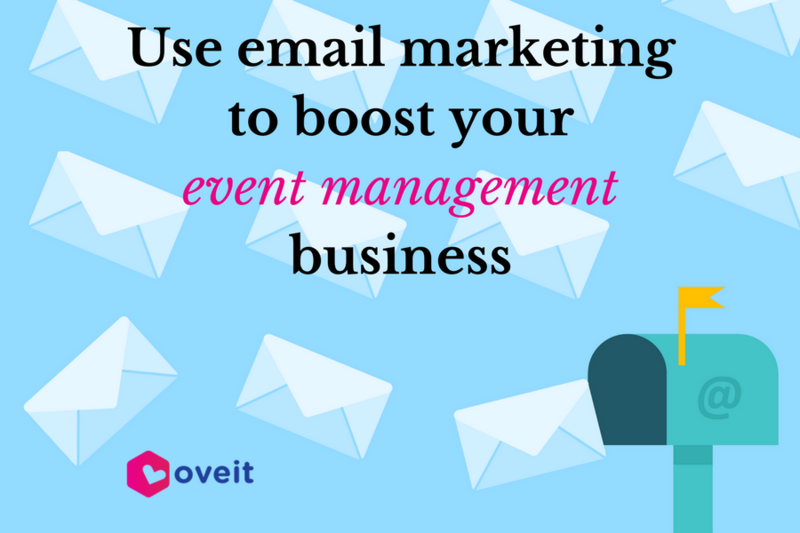 And this article is meant to show you how a strong email marketing strategy can support your event management business and why you should use this powerful marketing tool. One of the main reasons for which it’s so used is that it is easily measurable: a report from MillwardBrown Digital states that marketers find email marketing as the easiest marketing channel to measure ROI for. Another significant reason is that while social media channels have 100% ownership over your followers (and your reach can be affected by an unannounced algorithm change) emails give you absolute power; those people gave you their email addresses and you can reach them as long as the internet is still out here. Email marketing is cost-effective itself, but it can also help you reduce costs with printed materials that you now use. Ok, maybe you have some old-fashion clients that still prefer to touch their birthday cards or the discount vouchers, but for the rest of them you can use emails and reduce the printing costs. You can also automate emails so you use your time for other activities that help your business. Another way to monetize your email influence is by offering space for companies to brand your email template. It’s an unobtrusive way to promote your partners and it’s easy to see the results of your campaigns. It is crucial to keep your customers engaged, and also it is crucial maintaining a strong connection with your subscribers in order to make them buy. Studies reveal that prospects need more than 4 online interactions before buying a product (or service), so you see why is crucial to have rhythmic interactions with your (future) customers. By constant communication, you can educate your customers so they will be able to use all the benefits that you offer.Maybe you plan your annual festival but, for the first time, you will use NFC technology for cashless payments. If you have the email addresses of your customers (if you used a smart tool to sell tickets, you have them) you can educate them on how to use NFC. You can put up a trigger-based set of emails so when someone buys a ticket automatically receives a “Thank you” email, followed by another email that offers indispensable information on how NFC works.Trigger-based emails (that are automatically sent based on different actions performed by customers) have the highest open rate, so make sure that you use them. Segmentation is a very powerful marketing tool that we strongly recommend you to use. It helps you to ensure that every one of your subscribers receives relevant information (as mentioned before if you send a lot of irrelevant emails your subscribers will start to unfollow you). Assuming that you hold a conference twice a year follow up should be segmented separately for each event; let’s call them conference A conference B. It’s unprofessional to send a thank you email for attending conference A to someone who wasn’t there. If one event is focused on medicine and the other on marketing what is relevant for a segment of your audience is irrelevant for the other segment. So make sure that you provide useful emails for your two different groups of attendees. Maybe you hold a music festival that groups different types of music; let’s say you have an indie rock stage, an electronic stage and one for reggae. Although your attendees want to enjoy the festival experience, each one will be more interested in one type of music. Use your registration form and ask them what stage they prefer and segment your guest into 3 categories based on their music preferences. Keep them up to date with relevant info from their field of interest. Of course, for general info regarding access and on-site activities you can use only one newsletter. As I said before, another reason for which email marketing is so used is that it offers you easy access to data. You can see who opened your email, which links are clicked, who forwarded your mail, which emails bounced, unsubscribers and much more. This is great because it offers you a lot of hints on how to adapt your message. As you see, email marketing is a great marketing tool if used wisely. But you must keep in mind that, on a daily basis, the average office worker receives about 92 emails, 16 of which are spam (link report radicati.com). No one wakes up hoping that their day will be full of unsolicited spam messages so the first important step when creating an email marketing campaign is to obtains permission to email your future customers. The second is to provide quality information, otherwise, you will become just another unread email. p.s.make sure that your registration form contains an email field and do ask for permission to send informative emails. Infographic – Why use cashless payments for your water park? Festivals are becoming bigger and bigger every day; some good examples are Coachella, Tomorrowland, Mawazine etc., which are hosting hundred of thousands of guests every festival. The festivals are getting upgraded while their popularity is increasing. Organizers are bringing only A list artists, increasing the number of stages, accommodating more attractions and partners; the overall experience is getting better and better every year. Not only the festivals are getting bigger, additionally they are becoming more expansive too. Guests spend between 50 to 500 euro to attend such kind of event and their expectations have increased exponentially. Most of the crowd which is attending festivals is composed of Millennials which consider that experiences are more important than things. In this times, when people appreciate experiences more rather than valuables, it is important to do everything possible to fulfill this need and create a flawless and remarkable experiences. 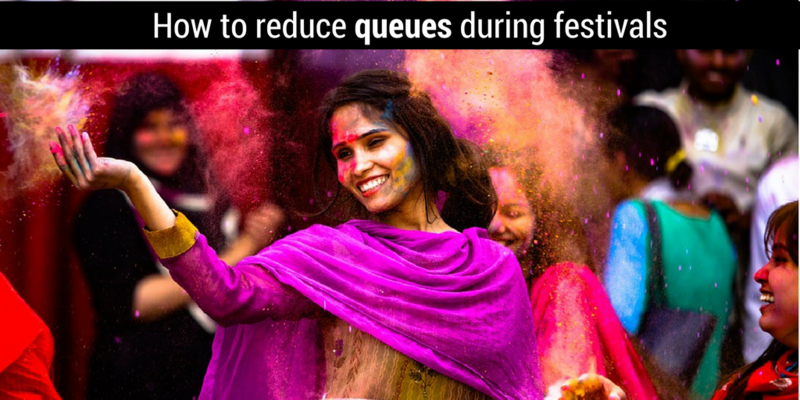 The most recurring issues that usually arises within festivals is queuing; nobody likes to waste their time waiting in line, however it always happens. The lines can’t be 100% avoided, though, there are a few practices which will reduce them considerably. One of the most popular practice which is becoming rapidly adopted by most of the festivals are the NFC wristbands. Through the NFC wristbands, event planners are trying to offer a higher event experience making it more convenient, secure and transparent. Visitors can top-up money on their wristbands at any point of the event, pay without queuing in lines – everything just with a simple tap while event organizers benefit of transparency and complete control with real time reports over all sales. The wristband is synced with a specific ticket category which allows the visitors to access all their designated areas more easily and if entitled receive perks such as T-shirts, free drinks, etc. Additionally with the help of the NFC chip, the wristband can be used to create a new level of interactions, such as: Treasure Hunts and challenges, rate favorite products or shows, save playlists, check geolocation etc. Since 2015 the NFC integrated wristbands started to become popular within the events’ world. If back then guests were complaining about wristbands’ failures which left them unable to buy food or drinks, today they do work smoothly and are reducing considerably the queue. No more queue for food and drinks, but how about the registration process. When attendees arrive at the event, they need to change their ticket into the NFC wristband. Unfortunately most of the attendees are complaining having to stay a few hours in line to get their wristband; it is of course a big turn-off, when the pre-event excitement is killed by a huge waiting time. Trying to be on-top of the situation, event planners are already finding solutions to combat this huge registration lines. Big events(e.g., Coachella) are shipping the NFC wristband directly to guests, right after the ticket is purchased. Guests receive precise instructions which they need to follow in order to configure their wristband from home. Also when arriving at the event’s premises, it is mandatory to have it already attached around their right wrist. In this way, guests can enter directly, without having to stay in line to do their registration. This practice turned out to be successful and diminishing the lines considerably. What are the biggest benefits when using the NFC wristbands? It is interesting how in a short period of time so many uses have been found for the NFC chips. With the use of a simple chip, attendees can do almost everything with it. Their Social Media profile can be synchronized and all their data stored and access after the event. An NFC wristband is the only thing you need in order to attend a festival. No need to worry for your wallet, money or mobile phone, you only need to be worried of not having enough fun.